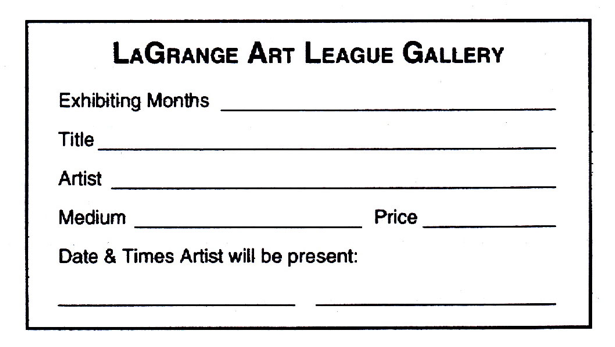 Note: Gallery Exhibition Cards are available to fill out at the LaGrange Art League. You do not have to print your own cards prior to bringing in artwork for the gallery. This page is to help explain the content of the cards. Indicate one month or two months. Note: If no entry is made in this space the Hanging Committee will assume the art is to be exhibited for only one month and will be removed from the wall for the following month. Please identify by printing clearly. Again, print your name clearly. This is important to the buyer. Note: If your artwork is mixed media, indicate what media are used (i.e. watercolor and pastel). Indicate the date(s) you will be volunteering. If you do not have a date set for volunteering, take the time to sign up on the calendar before you finish the Exhibition Card. After signing up for a date, fill in the time of day you will be volunteering (11:00-2:00 or 2:00-5:00). Click here for information on volunteering. Please PRINT all information on the Exhibition Card. Make sure you secure identification, such as a business card, on the back of your artwork. Be sure to include the title of the work. This is important as the Hanging Committee relocates paintings after they are hung and the gray Exhibition Card may get left behind. Note: If a piece of artwork can’t be identified, it can’t be sold. Unidentified artwork is ineligible for exhibit and sale and will be placed in the storage area in the basement.